A stylish looking boat that catches the eye as it has modern looking well-proportioned body. One of the most versatile boats you will ever come across, built and designed with a direct drive configuration, which resulted in a multi-sport performance boat, that is perfect for wakeboarding, tournament skiing and social boating. The Eclipse has the ability to satisfy the Wake boarders and slalom skiers within your crew plus it has all the power to thrill. Handling is agile and precise, providing all the genuine driving pleasure LEWIS owners have come to expect over the years. Push the throttle forwards and what you get is total security at speed and in corners. A spacious and comfortable boat with lots of room to move around in, the walkways alongside the mid-mount engine are wide so maneuverability is a breeze. The bow section is of the largest on the market providing plenty of room for two adults to stretch out and relax. The Eclipse offers a ride that is high and dry. Featuring a large rear storage locker, side pockets and a lengthy storage unit behind the observer’s seat, with tones of storage, there is plenty of room for all of your wakeboards, water skis and life vests which enables a roomy and spacious interior providing generous seating for eight. 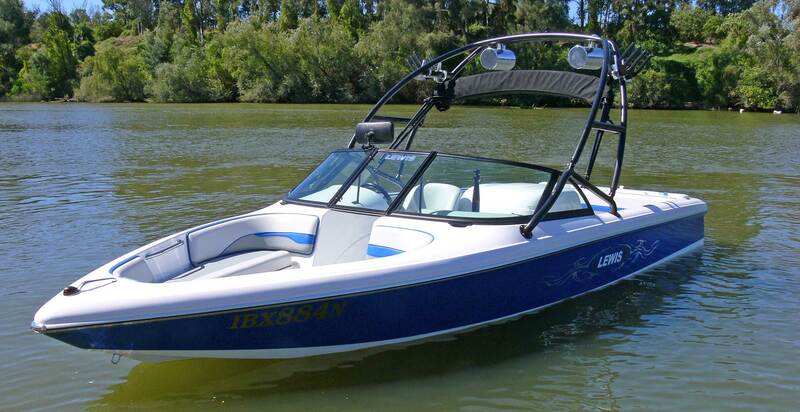 The Eclipse is also available with the optional Wake Enhancer for enhanced wakeboarding performance.